There's a lot to this trailer, and I don't have the time to go into depth--I'm trying to get the Penguins done--but what are the first words we hear? Oil. Most conservative Americans I know, and have heard view their positions, don't want the US dependent on oil from the Middle East; most liberals I know don't want there to be any oil at all, wanting only green renewable energy that regrettably isn't progressing fast enough for the requirements of the market. Regardless, most liberals--erroneously or not--pit conservatives and oil together. The beautiful Charlize Theron reminds me of the androgynous Seneg in World War Z, the liberal concept that women should be more like men, and men should be more like women. With her super-short, dark crew cut, I didn't even recognize her until the credits came up, and that is, ultimately, what liberals/socialists want: a "identity-less" individual-less" society made up of vast numbers of people who have no name, just a number, and worship the state as god. We won't see that in Mad Max Fury Road, but we will see conservatives appearing as monsters. 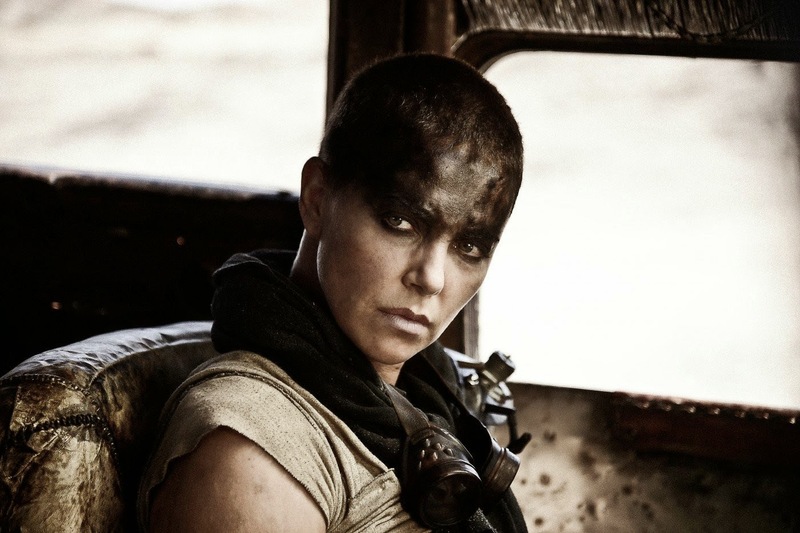 Charlize Theron as a character called "Imperator Furiosa," which, like the sound track we hear in the trailer, has a classical ring to it. Please note her exceedingly short hair--a symbol of her thoughts--and her head and eyes blacked out. With such short hair, we are probably meant to think of her as a character of "action" rather than "thought," since she doesn't need a lot of time to think about something, she goes with her "gut feeling," like most liberals. The black over her head/eyes symbolizes death, which is probably what she does think about, when she thinks at all ("If you want to survive this" she tells someone, so survival is her motivation). Her name, "Furiosa," which seems to be a play on the Riddick race of "Furians," as well as the Brad Pitt film Fury, suggests that she is, indeed, filled with fury, probably because of a wrong done to her or someone she loved, and that wound is going to be what she carries with her throughout the events. The catchy little song playing is Kula Shaker's version of Deep Purple's Hush. The opening lines, "We are an independent, international intelligence agency," is just like the James Bond villain Blofeld's SPECTRE, but obviously, The Kingsman try to undermine organizations like SPECTRE. Again, there is a lot to sift through in this trailer, but given that the camera holds on the shop window with the three men's apparel in it for so long, perhaps we should focus on that, too. First of all, The Kingsman is written on a shop window, which means, part of what they do is protect businesses. The cream colored suit on the left side is nice and formal, but not as formal as the suit on the right side, so we can say the cream colored suit symbolizes the middle-class, employees and business owners; the suit on the right side is a bit more formal, symbolizing those who own big businesses and corporations (they are also being protected) and, finally, the smoking jacket in the center would symbolize the "leisure class," or those with inherited wealth. Again, this "front" for the Kingsman is the real identity they are putting out. If you stop the trailer at 1:04, maybe it's just me, but the leg-blade girl looks more like a guy than a girl; maybe it's just me. This is one of those times when film makers are probably trying to jog our memory and get us to remember things in other films we have all ready seen--like James Bond and Jason Bourne films, or any spy film, for that matter--including Quentin Tarantino's Kill Bill. Why? Samuel L Jackson has helped Tarantino in nearly all his films, and--like the villain Valentine--Tarantino is hoping for a violent revolution, as was stated in the film Django Unchained, which Jackson was in. This might be a further example of pro-capitalist films using liberals as villains to make their point about what the Left is really trying to do, for example, when Robert Redford was cast as the villain in Captain America the Winter Soldier. The interesting thing about this "bodyguard" to Valentine, whoever she is, is she is obviously missing both legs; whether this was accidental or even intentional, we don't know, but the legs symbolize our "standing" in society, our reputation and how high up we can go on the social ladder (Eggsy, on the other hand, was a gymnast, so his legs are strong and nimble so he can climb up, and down, easily). She might be interpreted as someone who feels they don't have any social standing in the world--rather like Eggsy doesn't have anything to lose in joining the Kingsman--so that's why she has hooked up with Valentine. The next thing Colin Firth's character goes through is the headlines that are ridiculous and meaningless as to what is really going on in the world, suggesting that the media isn't reporting on the real news taking place; and what would that real news be? Samuel L. Jackson's Valentine tells us, humanity is a virus, and he intends on destroying all of humanity. At 1:31, when the countdown begins, everyone is at the beach, a ballgame, out and having fun, then everyone is beating everyone up; we even see a picture of the White House in this montage (but it's possible that's not how the film will have it). The point of this is, what is orderly and well-operating suddenly turns chaotic and violent (the chaos potion will destroy order in Strange Magic, as we saw last week). The point is, the White House instigated and "sponsored" riots of the last several years, as well as the immigration "invasion" Obama is supporting, is turning America from the well-run country it has been into a country of chaos and destruction. Gogo Yubari (Chiaki Kuriyama) was the bodyguard for O-Ren (Lucy Liu) in Quentin Tarantino's Kill Bill Vol 1. I don't quite know what to make of the trailer, but the tagline, "a major emotion picture" MIGHT be an indication that this film will debunk the liberals' insistence that, instead of people using rational thought and logic to solve their problems, they just "feel their way" through life. I can only hope. I do have a correction to make: I thought Night At the Museum 3 opened this weekend, and it doesn't open until next weekend; just Exodus: God and Kings for this weekend, which I am still going to go see tomorrow night.